To only offer 5 string and 6 string in 34" scale unless you get multiscale. 35" scale for a 5 and 6 string basses should be the standard. Like the Ibanez BTB, the MTDs, Laklands, etc. The 35" scale makes the B string tight and articulate. Fodera makes most of their 5 and 6 strings 35" scale. I'm tired of hacks telling me that the Fender 34" scale for a five string is acceptable. It's not. Carvin used to do a 35" 5-string. The XB75, I think it was called. Didn't sell very well. Kiesel now does a 5- and 6-string in a 30-inch scale on the Vader. My G&L 5 string is 34” scale and has one of the best B strings I’ve ever played on (and I’ve owned a Dingwall). A 34" scale can have a great B string. e.g. my Warwick Thumb, Ken Smith, Sadowsky. Bigger mistake: only offering the multiscale on a Vanquish and not the Icon/Xcellerator. Dometalican wrote: Bigger mistake: only offering the multiscale on a Vanquish and not the Icon/Xcellerator. The Vanquish isn't their only multiscale bass. Their first multiscale bass was actually going to be the Icon, but after they were developing it for a long while, they couldn't get it to look/feel quite right. I'm curious -- have you actually played a Kiesel bass? Or have you just settled on 35" as a magic number? I know a lot of people who have done that, despite the large number of pro gigging bassists doing quite well with 34". I've got Lakland 35" hanging on my wall. The B is no more articulate than the 34" Kiesel or G&L, and overall the instruments are no match for the Kiesels in playability. I've known a few bassists who insist their 34" of whatever brand just won't manage the B, and almost every time it comes down to a simple matter of choosing the proper strings and doing a proper set up. And of course letting go of the mantra and simply experiencing it objectively. 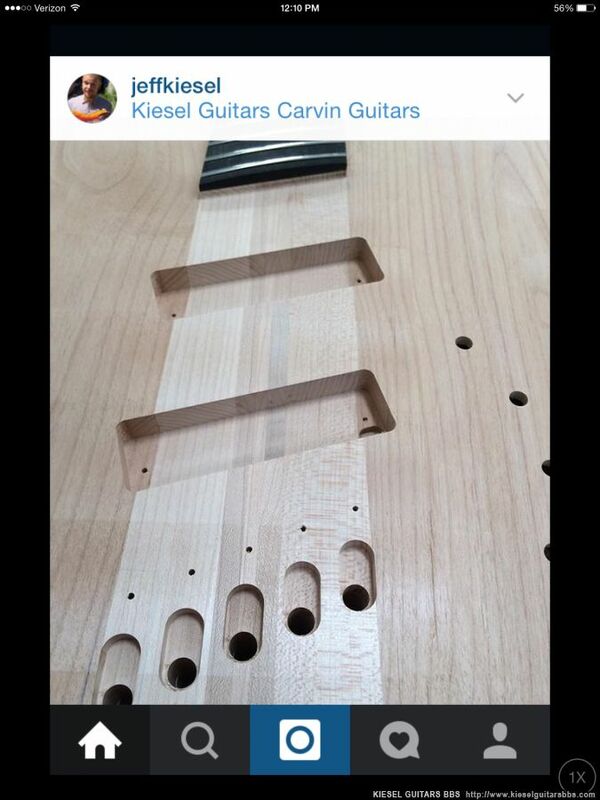 As for "mistakes" -- Kiesel is running at very near capacity for their production facility. They seem to be getting on just fine. I get frustrated that they don't offer piezo for bass, won't make a classic j without the control plate, won't offer an all-around edge bevel (like the K-series guitar), won't install a midi system, no Zeus acoustic bass, etc. All things I've asked for and been told no. Sometimes been told repeatedly, because Chris is very patient. But they are turning revenue like mad, so I think they have an idea of what they are doing. Bass makes up a very small portion of their sales, and adding odd electronics or trendy scale lengths isn't going to increase sales enough to make it worth complicating the order/build process. Just thoughts, I've owned a lot of basses over the years and when I get my first Kiesel it felt like coming home. Not every guitar suits every player -- how boring would that be? - so I hope you find what touches you. They DID offer a 35” scale. And then nobody ordered them. fizzchem wrote: To only offer 5 string and 6 string in 34" scale unless you get multiscale. Is there a reason you like a straight 35 Vs. A multiscale? Kiesel does not yet offer any 6 string bass in Multiscale. You can get the Vanquish and JB in multiscale 4 and 5 string. The JB is a lesser fan than the Vanquish. Have we yet seen a 4-string multiscale JB? And Jeff said something on Facebook about other headstock options besides the standard Sekou Bunch shape. Personally, I like the SB headstock. However, I really like the Icon headstock on a Peanut Butter 5. And it would probably look good on a JB5. Toptube wrote: Personally, I like the SB headstock. However, I really like the Icon headstock on a Peanut Butter 5. And it would probably look good on a JB5. Have they recently refused you a reverse Icon headstock? Toptube wrote: Have they recently refused you a reverse Icon headstock? My understanding is that they did stop allowing the icon headstock to be reversed for a couple years now. That's what I've had in my head for a while, but in a quick search, I can't find anything that would have put that nugget in my head. Multiscale likely only works well with the reverse, otherwise the headstock would have to be suuuper long. That said, if you go though the galleries for the Icon basses, there's only one with a reversed headstock, and it's an old photo. fizzchem wrote: I'm tired of hacks telling me that the Fender 34" scale for a five string is acceptable. It's not. Whoa buddy. You better cool those jets. You pretty much just called John Myung a hack bass player, as well as all of the other world class bassists who play Ernie Ball 5 and 6 string basses, as well as the world class bassists such as Ed Friedland who have reviewed thousands of basses over the years. There is no reason at all that a 34 scale bass can't have a nice sounding and feeling B string. I don't think Sadowsky offers a 34 scale standard, though You may be able to custom order one. Fodera offers some, but only through their custom shop. Now, this isn't to say that It shouldn't be an option. I think it should, and I am one of those few who actually owns an XB75. However, the fret spacing can be huge for someone who isn't over 6 feet tall, and to automatically denigrate the playing of someone who plays a 34 scale 5 string? That's freakin rude. Spent a good few months playing in drop A on a 34" 4. Sounded better than tuning UP to drop C on the 35" 5 that I had before. Sue me, my dude, but scale length doesn't dictate quality.